Micro:bit is a small microcontroller learning system, developed by the BBC in collaboration with the University of Lancaster for seventh grade students in Great Britain. The hardware and software tools are very well suited for work in school. Students can program interesting applications around a 32-bit ARM controller with very little effort, and without the need to worry about details of the hardware involved. As you can see on the Micro:bit web pages, they are very detailed and well used. But the Micro:bit can do more! It is a complete development system and in addition a versatile single-board computer for all kinds of tasks. This controller can also be used as a measuring instrument in the electronics lab. It is therefore exciting to examine the different properties of the system more closely. 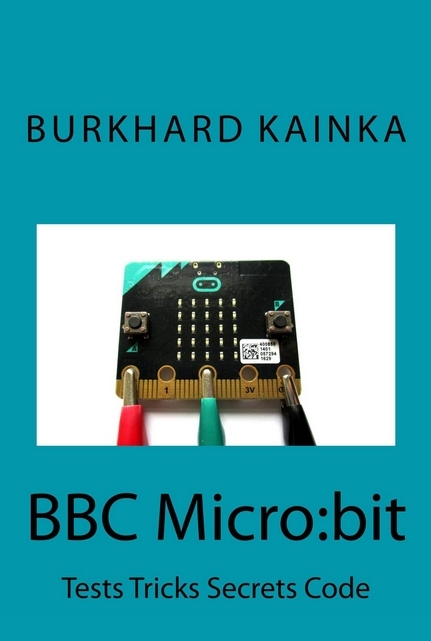 The aim of this book is to explore some of the many possibilities of the Micro:bit. The result of our little expedition into hard and software is something like a complete overview on the topics of microcontrollers, programming, electronics and measurement technology. Many of the aspects also apply to other microcontroller systems or to electronics in general. I hope you enjoy the experimenting and programming, leading to success with your own projects later! I am a STEM Ambassador - supporting the young generation regarding STEM aspects. When I found and read the German version - I immediately liked it. Completly new aspects, demos, examples adding to the other documentation out there. I find it sometimes too much on the Micro;bit website. Here you have a complete block to explain how it all hangs together, and as well new ideas. I love the oscilloscope and the 5 digit counter and how Burkhard displays it. Two counters 0..99 using just the 25 LEDs. And as well the low cost option to experiment and add some components externally. Normally, you need the Internet to compile code. Burkhard offers a very good starter solution: Download the whole code that is used in the book as code AND as hex, so you have it on your PC locally - no Internet required from then on if you do not want to - but can still try it all. After I had a look I had to translate it so we started a quick project. Just ready for Christmas, and it fits well with my own series of eBooks about Forth - and there is now a MECRISP version that runs on the Micro:bit. Thanks Burkhard - well done.